« How Many Words Can We Make? 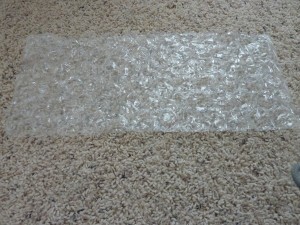 Did you know that packing bubble sheets are great for building fine motor skills? I grabbed a bunch out of a package we received a few months ago and stashed it away, knowing that I would be able to use it for something (I’m kind of like a squirrel this way, seeing things and storing them knowing I’ll put them to good use someday. 🙂 ). Well, as I was cleaning up a closet, there it was and I began playing around. I noticed that pinching and popping the bubbles required the same muscles I was working on with Andrew for building handwriting skills. Try it using your thumb on the top (or bottom) and your first two fingers (pointer and middle) on the opposite side as your thumb and pinch (like you are pinching tweezers together). Something so basic to work on such an important skill! This is a My Obstacle Course station activity to build those finger and hand muscles that was made even better by my assistant Katie who suggested using the dot stickers (garage sale kind I’ve used for patterning and “Make the Same” stations) to show the child specific bubbles to pop. While not necessary, the stickers help to provide focus as well as give a purpose. An extension of this is to put numbers on the dots in order to help with number recognition. 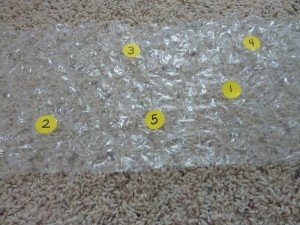 Write the numbers or letters on the sticker dots and then place them randomly on un-popped bubbles. 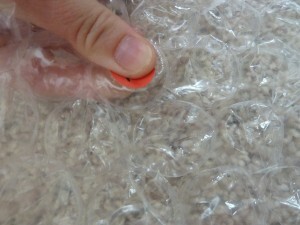 Have the child use their pincer grip fingers to pop the bubbles in the correct order. Popping the bubbles requires same pinching as pincer grasp so it helps build those muscles. 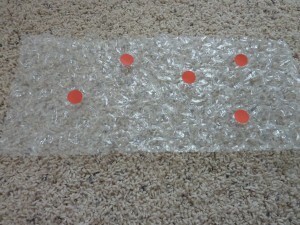 My Obstacle Course Station Activity: Pop the bubbles in order from 1-5. 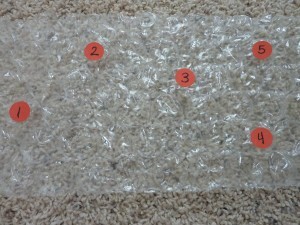 My Obstacle Course Station Activity: Listen to the number I say and pop the bubble with that number. Numbers 1-5 scattered for number recognition and number order.